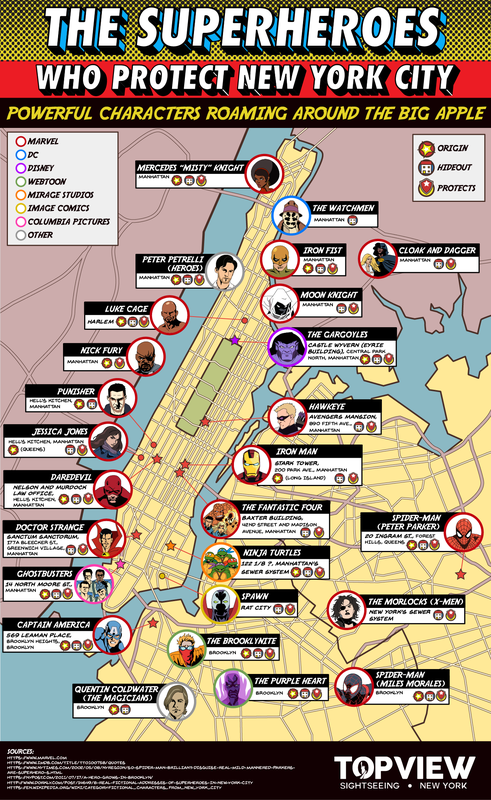 The map above shows some of the most popular superheroes from comics and film who protect New York City. It also explores the areas in which they either live, hide out, or roam for criminals. Wondering where Batman, Superman, etc. are? DC, unlike Marvel, tends to set its comics in fictional cities such as Gotham or Metropolis, whereas a significant portion of the Marvel universe is set in New York. Here’s just a small Marvel superheroes list covering the most important players. Enjoy this map? Please help us by sharing it and leave your comments below.